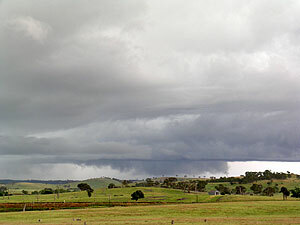 A rotating updraft just west of Yass, the suspicious cloud tag persisted for several minutes. Anvil lightning was a feature of the storm, here we also see strong inflow, another feature of this storm. Today's chase started as a repeat of yesterday, but the end result was a totally different storm. The day started on the coast with drizzle and overcast. However yet anothyer uuper trough was on the cards for inland southern NSW. I watched the radar for any development within 3-4 hours drive. 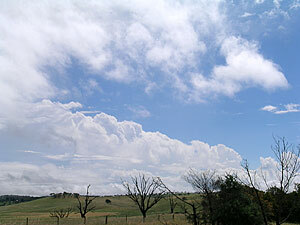 Around 12.30pm what appeared to be a weak squall line set up over the south west slopes. I contacted my chase partner for the day, Bryce, and set off. Like yesterday the top of Macquarie Pass was clothed in fog. 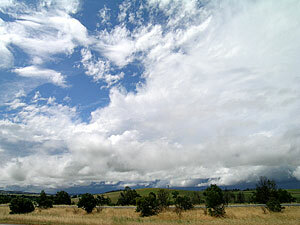 The low cloud and drizzle persisted right through to Goulburn, which is about 100km inland. I had been telling Bryce that I expected another squall line type situation, in fact filling up with petrol at Goulburn and listening to the AM radio I was convinced that the line was not that far ahead. Pushing further westwards and I was surprised that we had not encountered the squall line. In fact the low cloud and drizzle was persisting. We now crossed the Great Divide. Although not even a pimple by Rockies standards the Great Divide still divides air masses and today marked the point were the cool SE winds would begin downsloping. 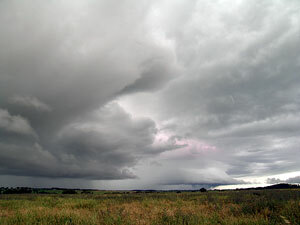 Sure enough in the space of five short kilometres the low cloud gave way to broken sunshine and the sight of storms. Upon emerging from low cloud and drizzle we break into sunshine to observe this storm towards Yass. Looking back at the low cloud and you can see how abrupt the clearing edge was. We had two options available. To the north was a line of storms with fibrous anvils, these were also over higher ground that was rather cool. To the west was a promising storm influenced by obvious strong shear. In the end there was no real choice. We headed further west. Approaching the storm and it became obvious that the storm was rapidly strengthening. We could not get a decent view of the base as the SW slopes region is very hilly. 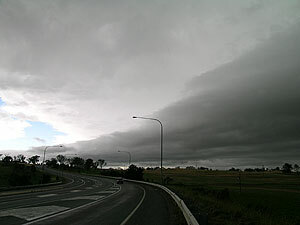 In fact by what we saw it appeared that a squall line was on the cards. We crested a hill that at last gave us a distant view, not of a squall line, but what did catch my eye immediately was a beautiful rain free base. 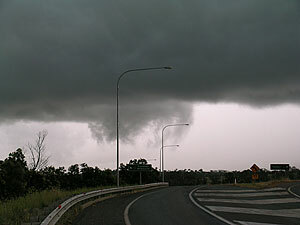 We pulled up on a highway offramp at Yass and observed a rotating updraft base. A suspicious cloud lowering developed and persisted for several minutes, I only have a crappy Hi 8 video and when speeded up the video looks very interesting. Anvil thunder was constant. As we watched, inflow winds began to pick up. In fact the inflow was now from the NE, the environmental winds were SE. Finally rain forced us to backtrack up the highway. This lowering persisted for several minutes. 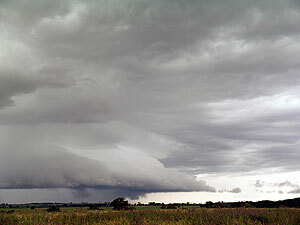 Looking 180 degrees in the other direction and a broad area of inflow. Unfortunately the road we backtracked on went eastwards and it took us 10 kilometres to get out of the anvil rain and odd small pieces if hail. The next views were more distant but still revealed inflow features and nice structure. Once again rain forced us to move, as soon as we got in the car both Bryce and myself saw a suspected funnel, it only lasted a few seconds and appeared to rope out. The storm was now nearing much higher land, and low cloud scudded into all parts of the storm, not to mention rain cooled air. Road options now deserted us, in fact the only option was straight into the storm. We took it and were quickly enveloped by torrential rain and the poor gravel road flooded. The storm was now outflow dominated, the cool slug of air was just too much. The radar picture also revealed that another storm from the north also merged into this system. Unfortunately road options took us just little too far from the action, too far away to judge rotation. 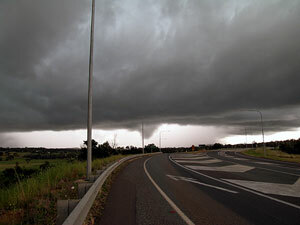 This is an inflow feature, note the scud coming in from the right. It was now time to head home with rain from old anvil for much of the way.